You will be collected from your Orlando accommodation and taken to Disney Springs by either a 5-star stretched limousine where you have approximately 2 hours free time to explore this area. 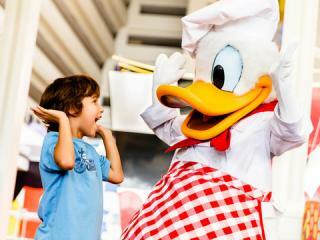 You will then be re-collected and delivered to Chef Mickey’s Restaurant at Disney’s Contemporary Resort for a true feast in the company of Mickey Mouse, Donald Duck and the gang! Have your autograph books and cameras at the ready as each character will visit you at your table as you tuck into a delicious buffet dinner including roast pork, roast turkey and prime rib along with a full children's menu and a selection of mouth-watering desserts. Ticket includes return transfers from Orlando hotels or Villas in a luxury stretch limousine, champagne and water for the journey, Character Dinner at Chef Mickey’s Restaurant, large table for entire group, complimentary family photo. Free time to explore Disney Springs before dinner. You will be visited by a number of primary characters during dinner, but it is not possible to guarantee the attendance of a specific character. Transfers are done on a shared basis, so you may share with other families/couples depending upon the number of persons in your party. Pick up is between 1.00pm-3.00pm. Exact times will be advised upon reconfirmation locally. Before dinner, you will be taken to Disney Springs where you have approximately 2 hours free time to explore this area. You will then be re-collected and taken to Chef Mickey's for your character dinner. Gratuities are not included and payable locally.